Would You Pay $16,000 For This Diesel 1985 Jeep Scrambler? The Scrambler has long been one of Jeep's more sought-after editions. Add in the Cummins diesel that has been bolted to today's Nice Price or Crack Pipe contender and the only thing that you might think is left to do is to see if its price makes it worth the scramble. Yesterday's 1959 Falcon Caribbean started on the wrong side of a narrow vote, but by mid-morning things had remarkably turned in its favor. In the end, it squeaked by with a 52% Nice Price win, a laudable result for so interesting a car. Would You Pay CA$10,500 For This 1959 Falcon Caribbean Time Capsule? Yes, there was some assembly required with that barn find, and the ultimate cost versus value of the project upon completion is going to be hard to peg. That is why today we're going with a project that's way further along. The Jeep CJ-8 was a long wheelbase (103-inches) version of the CJ-7, and was was offered by AMC from 1981 through '86. Fewer than 25,000 were sold over that time, although one was notably purchased by Ronald Reagan for use on his ranch. Today the model is known more commonly by the Scrambler name, and further model differentiation was offered with SR (Scrambler Renegade) and SL (Scrambler Laredo) trim packages. Today's Scrambler is a project that, much like yesterday's Falcon, has a lot of interesting aspects to its build. Unlike that fiberglass Brit however, this Jeep is pretty much all-American in both its intent and execution. It also runs and is apparently ready for the road. Well, maybe not quite ready as it does still seem to have a couple of things missing. First off, there's the windshield, which is either not installed or is impossibly clean. Then there's the hood which I'm sure is around here someplace. Perhaps the hood is off because the intake piping on this Jeep's most interesting feature precludes its closing. That piping is connected to a fat turbo which in turn is hooked up to a 1995 Cummins six cylinder diesel. The 5.9-litre 12v 6BT is late of a Dodge Ram and is not a totally uncommon conversion for Jeeps. In '95 the engine would have come with an intercooler, notably absent here, so the 175-bhp/420 lb-ft of torque spec'd from the factory may not be in fact all present here. Whatever the output, it all is channeled through a New Venture 4500 5-speed stick and then to a Detroit locker diff on each end. The truck has been jacked up - meaning raised, not jacked up/messed up - and rides on what look to be A/R Outlaws wrapped in seriously big meats. Above all that there's a family cage extending all the way to the back and precluding the use of a Scrambler cap. In fact, there's no obvious weather protection with this truck, either for its passengers or the half-ton of diesel mill up front. Like I said, this is a project, and it's obviously not quite done yet. What has been done looks to be pretty dang interesting and it's now time to decide if your interest is further piqued by its $16,000 price tag. Now, Scramblers are relatively rare and as such they do command a premium over their smaller siblings. The Cummins is also a very desirable mill. Put them together and what have you got? Well, the seller hopes that adds up to sixteen-large. What do you think, does his math add up? Would you pay that much for this diesel Jeep? 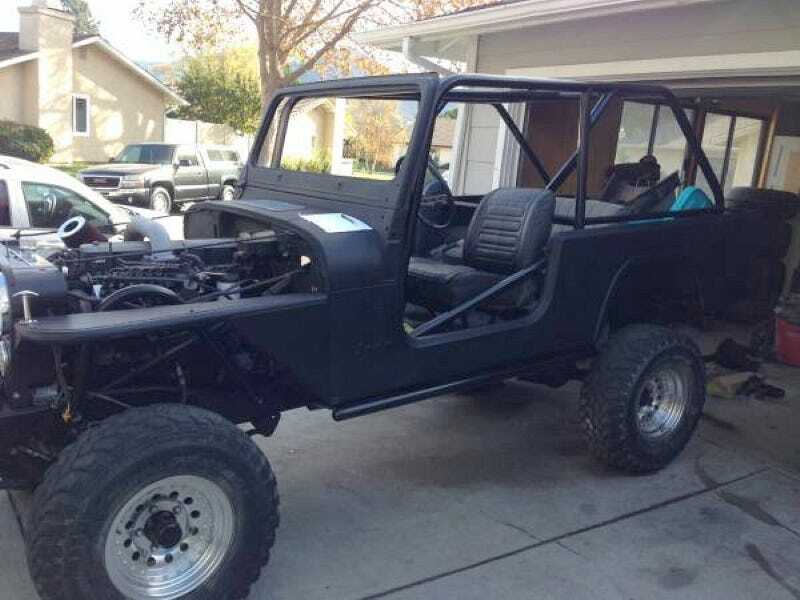 Or, is this a project CJ-8 that you wouldn't scramble to own? Santa Maria Craigslist, or go here if the ad disappears.